In case you missed Jared Calaway's post, he has a book that he co-authored coming out with Polebridge Press. 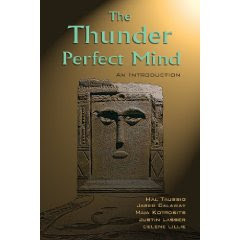 It is a re-translation and re-examination of the Nag Hammadi poem, The Thunder: Perfect Mind. It can be pre-ordered on Amazon HERE. I am proud of Jared who worked with me as an undergraduate for four years at Illinois Wesleyan University before he entered the Ph.D. program at Columbia where he is now finishing his dissertation under the tutelage of Alan Segal. Congratulations Jared! Incredibly I am going to start filming a short film based on this poem next week. Now I almost wish I could wait until I read the book! As I paraphrased the text, I couldn't help but feel frustrated by the repetitive nature of the poem. As I picked through I found references to various Sophia stories. I also found an angry 20th century feminist! When the film is finished I will post it on a website I will share with you later so everyone can watch it. Or download it off iTunes. Richard: Repetitive in what way? In the typical way of ANE, Egyptian poetry, which uses parallelism? Or in larger chunks of repetition? In the chapter on poetics (which I wrote), you will find that, like a lot of great ancient literature, the author anticipates, then discusses at greater length, and later echoes most of the themes of the poem. 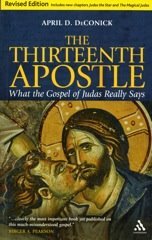 The same thing happens, for example, in the Epistle to the Hebrews, although with very different themes and concerns and style. I think if you look very closely, you would notice that each "repetition" has an alteration, a riff so to speak that enmeshes it with new themes and concerns. I would think of it as a jazz score rather than a classical piece. Or if a classical piece, it would be most like a fugue (I actually call it that in my chapter on poetry). In the book, we also notice the "anger" of the speaker, in contrast to a lot of interpretations that see a more positive reading. April: Thanks for the free advertisement! I am already thinking of how to extensively elaborate and rethink my work in this volume, hopefully someday into a comprehensive book-length treatment in itself. But first the dissertation! Btw, our translation does not particularly emphasize the repetition, since we ended up translating it partly into English canons of poetry, which prefers variegating synonyms rather than repeating the same word. Thx for your comments, Jared! Yes the repetition you described is what I meant. At first I thought to cut out several chunks of verse so the poem, which will be recited by a female actor, is a little more manageable. But as I saw that themes were handled this way, I elected to leave most of the lines in. I should look at using my own variegating synonyms too. hmmm. Btw, we do have discussion of current usages of the poem in different performances, it is quoted in Umberto Eco's "Foucault's Pendulum" and I think Toni Morrison uses it. It is even in a prada ad, or some fashion ad at least. It seems that scholars are the only ones who have not developed a healthy interest in the poem! I and the other authors would be fascinated by what you do with it! When I saw the prada ad on youtube.com I almost gave up the project. It is quite good but it is also a very different take on the work than mine. So I am slogging ahead. I hope I do the work justice and that everyone likes it.